You don’t know when a crisis will hit your small business. Often given the nature of a crisis, it will come when you are unaware and running your business peacefully on cruise control. It is then that the mayhem of a crisis may swoop in and potentially cause detrimental damage. The idea that a small business crisis will descend upon your company is not a matter of “if” but of “when”. So this article is one you should pay attention to and act on in order to help you define a small business crisis management plan. A crisis can come in many forms for a small business. Whether it be losing a large client, an unexpected drop in revenue, a poor customer review that goes viral or many other tragedies that can happen to your small business. When it does happen it could take your company right to the edge of failure. So you need to ask yourself, how you will manage a small business crisis that could potentially determine whether or not you will withstand it. In most small businesses, the absence of a crisis management plan is fairly normal. Most small business owners just don’t think they need one, or have not yet experienced one in order to make it a priority, or even worse they don’t know how to create a crisis plan. Whichever the case, we want to do our part to help you change this. The potential collapse of a small business due to a crisis will become a matter of survival, and that survival will depend on your ability to know what needs to be secured, what needs to be rebuilt and what needs to be reinvented from scratch, and then rapidly execute it. In those precarious moments of your small business crisis, you will need to take on the mindset of a startup and move quickly. The storm that comes and potentially devastates your revenue or market share needs a plan that gets you back on solid ground with stability that can be carried out quickly before the entire business succumbs to dissolution. Your small business needs to have a crisis game plan that includes what needs to be accomplished in order to survive when the crisis hits. The first step is to tackle a small business crisis head on is to meet the issues at their root. Be straightforward and honest with your internal team on what is transpiring. Also, if the outside media is involved, you will want to take ownership of the issue and declare your investigation if you don’t have all the details yet, or admit to your error and apologize. Keep the explanation simple and to the point but then take actions to alleviate the subsequent weak links. If your crisis involves a natural disaster or climate tragedy then taking safety precautions early on and enforcing step by step protocols for evacuation and property security must be advocated. Here are a few preparations you should be considering in your small business crisis management plan. Determining Potential Crisis Situations – This is the cornerstone of your crisis plan and will bring to light all the potential pitfalls your company could experience. Taking the time to carefully list these potential crisis issues will help you to layout your solutions to each one. These can be damage situations that can happen out of the blue, medical emergencies, explosions, act of violence, controversies, drastic revenue cuts and other catastrophic affairs. Fleshing these out completely will ensure that you are prepared appropriately for the many potential scenarios that could occur and have the right action plan in place to deal with them. Evaluation of Local Climate and Natural Disasters – Your evaluation needs to consider regional and seasonal weather phenomenon while also the potential larger disaster scenarios that have a slight though possible chance of hitting your business’ location. The inclusion of hurricanes, tornado, blizzards, and flooding should be examples of scenarios to prepare for. Your physical property and the trained safety of your entire staff should be factored into this evaluation as well. Do you have an accurate account of all inventory and equipment that may need to be fixed, replaced or remanufactured should a crisis occur? Company Leadership and Spokesperson During the Crisis – Leadership is always the first hub to secure during any small business crisis. It is critical to have one designated voice who everyone on the team knows will serve as the spokesperson and the lead director during a crisis. This may or may not be the Chief Operating Officer or owner of the small business, depending on how your business is structured. The responsible person should be well versed to not only lead the crisis procedures internally and communicate critical information and updates with staff and customers, but also be the main point of contact for all outside media, and news channels. Offering interviews and answering questions with a transparent candor will help smooth out your crisis when it comes. Communication Flow (Internal and External) – Effective communication is extremely important to utilize during any problem and most especially during a crisis. Protocols and procedure of disseminating accurate information and relaying it promptly to personnel, customers and suppliers prior to the media, must be first and foremost. Over communication in this instance will work to your benefit as opposed to a “wait and see strategy”. Update your internal organization staff, suppliers and the community regularly and use social media is the channel for this to be done efficiently and in real-time. Provide your followers with your judicious assessment of the crisis, your intended action plans and then swiftly alleviate any false information , misrepresentation and rumors that may emanate from employees, customers or the media. You may want to also include your handling of your own current marketing efforts, the cancelling of specific ads or promotional campaigns within your crisis management plan as appropriate. Internal Operation Process and Procedures During the Crisis – How you revise your instruction of operations within the workplace during an actual crisis will conceivably change depending on the crisis in question. You will need to have a relatively detailed operations process for each one depending on the nature of your small business, it’s location and the potential dangerous hazards that each scenario could stimulate. Evacuation routes, emergency procedures, meetings to be held if under a hacking attack, safety plans, media coverage protocols and many other specific actions that must be immediately set in place and managed. Keep in mind that while this process of creating a thorough crisis plan is time consuming, however it is an effort that will be invaluable on the day a crisis presents itself to your small business and very well may be the catalyst for a much quicker and stronger recovery. 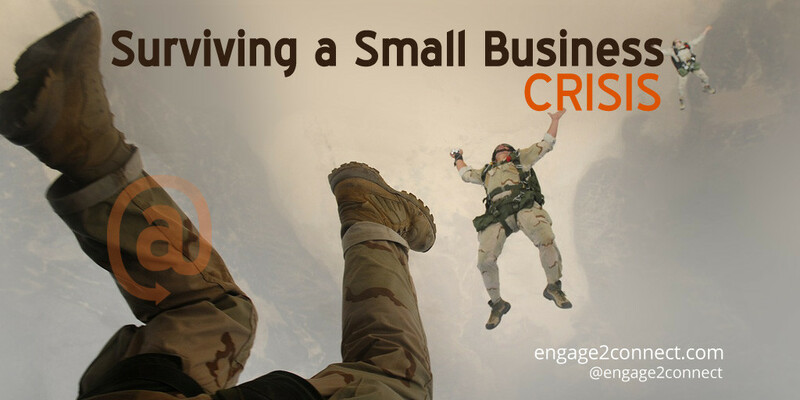 The dust has settled and your crisis management plan has been the the driving force in pulling your small business out of the foxhole and back onto solid ground. What should be your next steps? Here are two post crisis activities that may need to be given added attention. Infusion of New and Powerful Ideas – If your small business is facing the drastic loss of a large account or rebounding from a piercing of its reputation, there may need to be a measure of reinventing of your core business and adding diversification. You may need to consider taking a new direction with the focus of replenishing your revenue. Adding new thought leaders to your team, whether as part of your full time staff or as an outside professional might be helpful in order to regroup and navigate toward faster growth. The additional talent should be able to offer powerful new ideas on rebuilding without unwanted expense and this can make a huge difference when existing teams are in recovering from crisis mode. Social Media Game Plan – Crisis occurs when least expected and an immediate strategy for social media needs to be implemented in order to circumvent post crisis false information and rumors . Keeping a strategic plan to address the outside media as well as your current client base as the business starts to rebuild must be a priority. Social media is a powerful tool in this strategy, since it is a great platform to give accurate information in real-time, but can be distributed with a thoughtful message in order to keep your small business’ image secure during your recovery. It is not the ups and downs in the journey of your small business that should prevail, but the overall attention to a strong multi-level crisis management plan that will provide your small business its longevity. Plan, plan and plan again. You must be prepared for these eventual pitfalls and then have a sequence of activities documented that can be immediately acted upon. Once the crisis starts to subside it is equally important to set up checkpoints and systems to make sure that there is not a recurrence of the same scenario. Reinforce this with your stabilized customers and loyal brand advocates. If your strategy is well developed and implemented you will start to see within a reasonable time a resurgence of sales and new growth for your organization. You might have to tweak internal operations and processes along the way since the potential of new training and additional checks and balances will have been added during the crisis damage control. Don’t forget that not every crisis plan has just one type of outcome, so to include a few alternate contingency plans based on various outcomes makes the best strategic sense. Again, consider that your small business could encounter a natural disaster, the loss of a big client, drastic supply chain interruption, a PR nightmare, or system hack. You will need to have a plan for numerous potential scenarios that could befall your small business. In this challenging world we not only have to be reactive to our customers and employees needs but we also need to be proactive to the dangers that can descend upon any small business at any time. Be prepared with a clear and actionable crisis management plan while you have the luxury of lucid thinking and calm waters on your side.